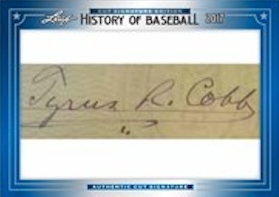 There is something about baseball and its history that fans find mesmerizing, and owning a piece, any piece of it, is a baseball collector's dream. 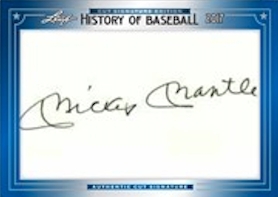 2017 Leaf History of Baseball Cut Signature Edition offers Hall of Fame buffs another chance to find rare autographs by legendary ballplayers. Each box guarantees one cut signature. 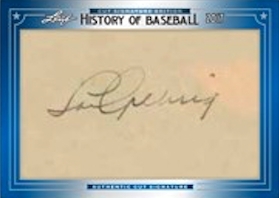 The 2017 Leaf History of Baseball Cut Signature Edition cards have a similar look to the 2015 set with the exception of the card's frame color. Displaying Leaf's Metal Prismatic technology, the cut signatures are surrounded by a lustrous blue frame. 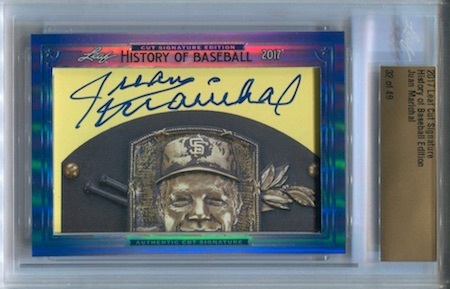 Of course, with iconic baseball heroes involved, each card is also slabbed for even more protection. 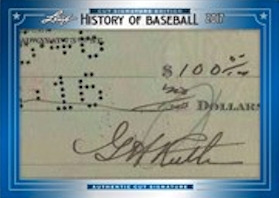 Keeping it simple, collectors can find one Authentic Cut Signature per box. 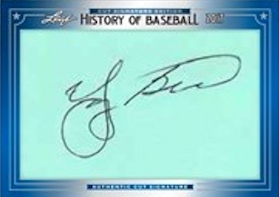 Featuring only those who can call Cooperstown home, every encased card is serial numbered. 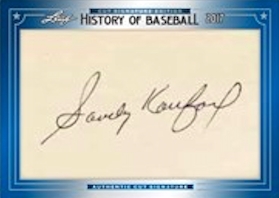 Additionally, to maintain the product's overall rarity, 2017 Leaf History of Baseball Cut Signature Edition is a print-to-order set. Please note these are mock-up images and are not final. Contents and designs are subject to change. Serial numbered on label. More players are included than listed below. Shop on eBay. Jeremy T � No pricing info yet.